Santa Fe ISD will have a news conference at 4 p.m. Central Time today at 4133 Warpath Avenue. On Sunday, Governor Greg Abbott asked all Texans to take part in a moment of silence at 10:00 AM CDT today, May 21, 2018, to honor the memory of the victims of the Santa Fe High School shooting. “The act of evil that occurred in Santa Fe has deeply touched the core of who we are as Texans,” said Governor Abbott. “In the midst of such tragedy, we pray for the victims and those mourning in Santa Fe, while we work to ensure swift and meaningful action to protect our students in schools across our state. I ask all Texans to join in holding a moment of silence tomorrow morning to remember the victims, their families, and first responders of the attack that took place at Santa Fe High School.” The governor also attended a church service Sunday morning near the school. CBS News reports the nation is watching Texas to see if anything will change in a state where Govenor Abbott has an A+ rating from the NRA and is a Republican (red) state. Santa Fe High School remains closed today after a Sunday memorial service was held for foreign exchange student Sabika Sheikh from Pakistan in Stafford, Texas where hundreds attended. A community event in League City, Texas also was held as a tribute to the 8 students and 2 teachers killed. Santa Fe High School in Texas will remain closed as the community grieves and the investigation continues into the mass shooting there on Friday morning. Ten people were killed. On Saturday, FBI Houston tweeted 13 people were injured. On Friday morning, a Santa Fe High School student opened fire on the students and staff at the school at 16000 Hwy 6 in Santa Fe, Texas about 48 miles southeast of downtown Houston. On Saturday, Galveston County District Attorney Jack Roady released the names of the 10 people who died after families were notified. Roady also asked the public to continue to pray for their families. The school shooting took the lives of substitute teachers Cynthia Tisdale (63) and Glenda “Ann” Perkins, Christopher Stone, a Santa Fe High School football player, Sabika Sheikh (17), an exchange student from Pakistan, Jared Conrad Black, Aaron Kyle McLeod, Angelique Ramirez, Kimberly Jessica Vaughan, Shana Fisher and Christian Riley Garcia. The suspected shooter, 17-year-old Dimitrios Pagourtzis remains in the Galveston County Jail on capital murder charges without bond. He is reported to be in solitary confinement. The suspect began shooting in an art class Friday morning and was taken into custody shortly after. 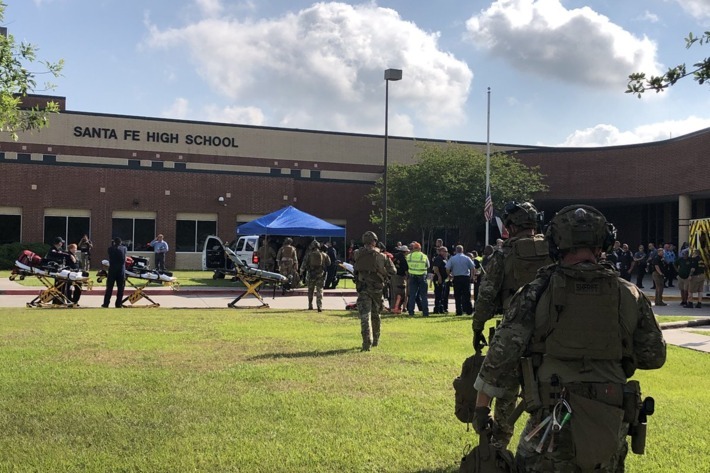 “This just the beginning of what will be a very robust response by both local, state and federal offices, we come together today as we deal with one of the most heinous attacks that we have every seen in the history of Texas schools,” Texas Governor Gregg Abbott said Friday. “Our community has suffered a terrible tragedy. We mourn the loss of ten members of our Santa Fe ISD family, eight students and two teachers. Our hearts go out to the parents and family members who lost loved ones. We are feeling the overwhelming grief of this horrific event. We are committed to ensuring that all of our students, families, and staff receive thecare and support they need during this tragic time,” stated Dr. Leigh Wall, Santa Fe Schools Superintendent in a news release Friday. For now, a Santa Fe ISD schools will be closed on Monday, May 21 and Tuesday until further notice. “We want them to know that their graduation status will not be impacted by today’s tragedy,” Dr. Wall said Friday to assure senior students concerned about graduating. A 24-hour toll-free crisis hotline also is set up for Santa Fe High School students, staff and faculty at 1-800-595-0869. Since the school shooting Friday morning, the Santa Fe community has come together for prayer vigils. People also donated blood this weekend for hospitalized victims. The blood drive continues Sunday, May 20th at UTMB Jennie Sealy Hospital, 712 Texas Avenue in Galveston, Texas. Blood donations will be accepted from 9 a.m. to 3 p.m. in the lobby, second level of the hospital. 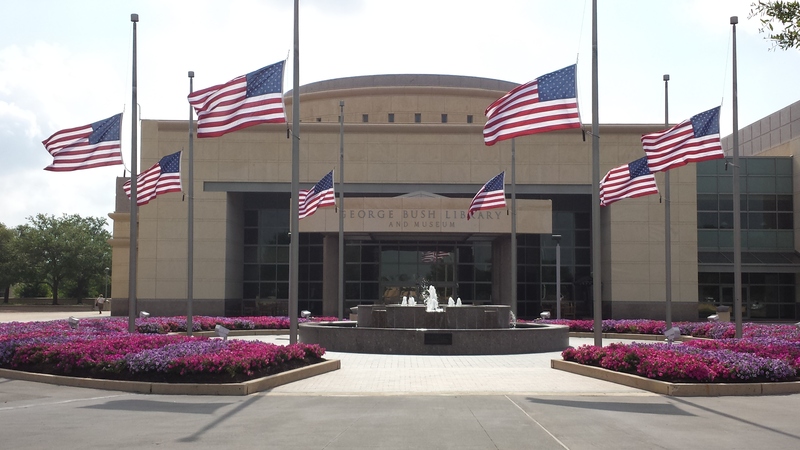 Flags across Texas and at the Bush Library in College Station were lowered this weekend for Santa Fe High School. 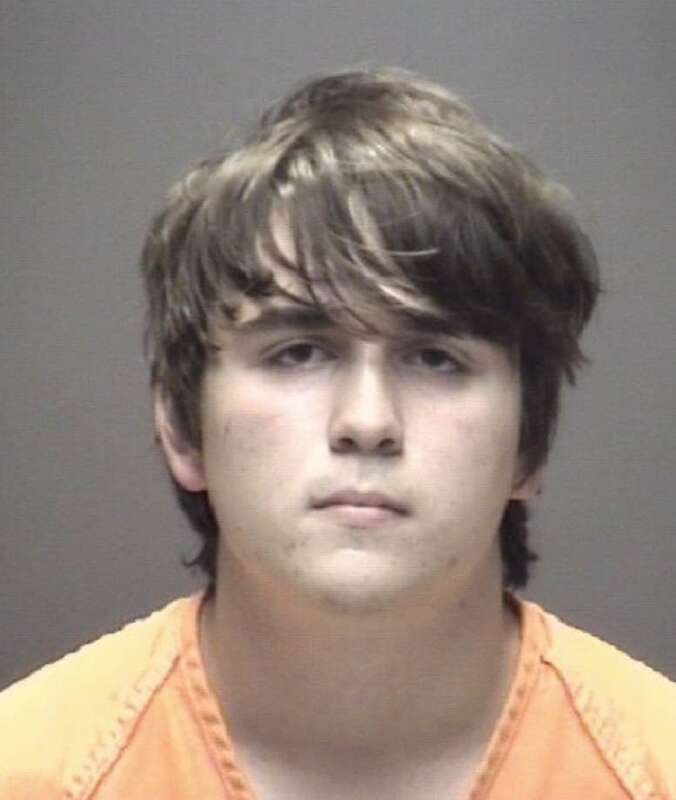 This entry was posted in Houston News, National News and tagged Santa Fe Texas High School Shootings. Bookmark the permalink.